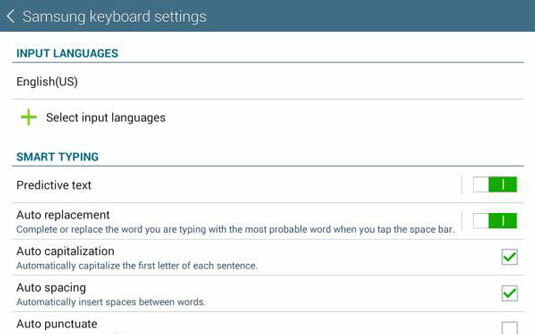 The quickest route to keyboard settings on the Galaxy Tab 4 Nook is from the onscreen keyboard. Notice the Settings (gear) icon to the left of the large spacebar? Tap it to display the keyboard settings. Your Samsung Galaxy Tab 4 NOOK will most likely arrive with U.S. English as its default language. To add other keyboards, tap the Settings (gear) icon on the keyboard and then tap the green + mark. When you add a language, you’re asked if you want to update the list of available character sets. Go ahead and do so; you might find some very interesting choices, including some languages you might never have heard of. Choose a new keyboard by touching and holding (a long press) the spacebar; then slide left or right. To turn on or off a foreign language keyboard that you’ve downloaded, tap the Settings (gear) icon on the keyboard; tap the + Select Input Languages command. Then add or remove a check-mark beside a language. Here, you see one at work. You must have at least one language selected. Be careful here; you could accidentally remove the check-mark from English if you have another language enabled. If you do that and find yourself unable to communicate, you’ll have to retrace your steps to this screen to re-enable English. Predictive text. 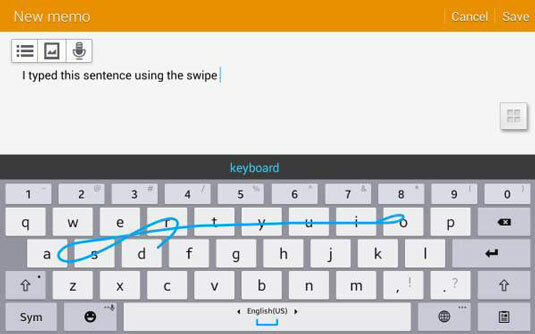 The tablet will try to guess what word you’re typing as you type. Keep an eye on the black panel in the middle of the screen. If you see the word you want, tap the word. From time to time, you’re certain to let a misspelled or just plain odd word slip through. Your tablet will think that is exactly what you meant to say. If you see a suggestion for a word that’s wrong — one that you don’t want to have to deal with again — press and hold your finger on that word. When the tablet offers to remove it, tap OK.
Auto replacement. You type Thank and the tablet guesses you next want to say you. If so, tap that word and proceed. Auto capitalization. Put a check in the box to automatically capitalize the first letter of any sentence. Auto spacing. This option is important when you use dictation or swiping. The tablet adds a space between each word without you having to press the spacebar. Auto punctuate. The tablet inserts a period (also known as a full stop) anytime you tap the spacebar twice. There’s no easy way around this: Some people absolutely swear by Samsung’s Swipe keyboard, and other swear at it. If you turn on continuous input, you can draw words by moving your finger on the keyboard from letter to letter. To type cat, you tap the letter c and then proceed diagonally leftward to a and then diagonally rightward to t. Lift your finger and if the universe is properly aligned, the word for a domesticated (or not) feline appears in whatever document you are working on. Practice for a while, and spend time telling the system to throw away errors and not keep throwing them back at you, and certainly not to get all huffy about it. Start slowly. Even then, you’ll probably end up with more characters than you would using the old one-finger hunt-and-peck method. Capital letters. To go into uppercase, tap a letter and then drag your finger above the keyboard. Double letters. If you want to spell a word with double letters, make a little loop on the doubled character. Strictly a matter of personal preference, but you might want to hear a little click each time you press a key. The second option, in the Key-Tap Feedback section (under Settings) is Character Preview. When you tap a character, the letter or symbol is shown in a cartoon-like bubble.